What better cookie for the holiday, right? 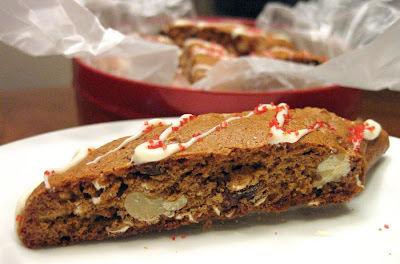 It just screams Christmas and being that is it a biscotti, it packs well, freezes well and will last for several weeks. Every year I send my brother biscotti for Christmas and this year he got these and Banana Pecan Biscotti. Preheat oven to 350º F and place the oven rack in the center of the oven. Line a baking sheet with parchment paper. Bake walnuts for about 8 minutes or until brown and fragrant. In a blender or food processor, process 1/2 cup of the rolled oats until finely ground. In the bowl of your electric mixer (or with a hand mixer), combine the 1/2 cup of finely ground oats, the remaining 1/2 cup of rolled oats, flour, sugar, salt, baking powder, baking soda, and spices. In a separate bowl, whisk together the eggs, molasses, oil, vanilla extract and orange extract. With the mixer on low speed, slowly add the egg mixture to the dry ingredients, and beat until combined. Scrape down the sides of the bowl as needed. Mix in the chopped nuts and raisins and beat just until incorporated. With a dough scraper or spatula divide the dough in half. Take each half of dough and divide in half again. form each half into a log, about 10 inches long and 2 inches wide. Transfer the logs to the prepared baking sheet, spacing about 3 inches apart. Bake for about 20-22 minutes, or until golden brown and dough springs back when touched. Remove from oven and let cool on a wire rack for about 10 minutes. Reduce oven temperature to 300 degrees F.
Transfer the logs to a cutting board and cut into 3/4 inch slices, on the diagonal. Place the biscotti, cut side down, on the baking sheet. Bake for about 4-5 minutes, turn slices over, and bake for another 4-5 minutes or until dry and firm. Remove from oven and let cool. White Chocolate Glaze (optional): Place white chocolate in a small bowl and microwave on 50% power for about 30 seconds. Stir and heat again for another 30 seconds until melted. Continue to stir until the bowl is no longer hot. Spoon the melted chocolate into a small plastic zip lock bag and cut a small slit in the corner. Drizzle several thin lines of the chocolate over each biscotti. Let the biscotti sit at room temperature until the chocolate has completely dried. This biscotti looks so good! Definitely delicious-looking! Thanks for sharing! Wow! this looks so delicious. I love it. Thanks for all your recipe. Biscotti is absolutely my favorite dessert ever. (I am addicted). Glad to see a few recipes I just have to try now, especially since gingerbread biscotti is one of my favorites but only sold in stores around the holidays. Mmm I've been craving a good ginger cookie lately. :) Hope you're doing well! I've been a slacker with commenting on blogs lately.